Flash Back Friday - Family Gaming - What Do You Play on the Holidays? Its the day after Thanksgiving, and yesterday, after clearing the plates from our feast, our family played Scattergories, Cockroach Poker and Heck Meck. When I was a kid, it would have been Monolpoly, Dominos or Blackjack. In later years these games were replaced by Trivial Pursuit and Pictionary. The games we play after holiday feasts may have changed, but the fun we have hasn't. Do you play games with family on Thanksgiving? If so what do you play? Assault of the Giants is a solid game based on a well-known IP. Why wasn't it more popular? Power Grid, designed by Friedemann Friese was published way back in 2004. It is still going strong with it's most recent expansion, Power Grid: Fabled Expansion, released in 2017. It's been called a crayon rail game without the crayons, an auction game, a train game without the trains. Whatever you call it, do you love it or hate it? Do you still play it? Flashback Friday - Talisman - Love it or Hate It? Do you Still Play It? Flashback Friday - Shadow Hunters - Love it or Hate It? Do you Still Play It? A little-known release from a one-time publisher, The Hellgame is the other side of German game design: visceral and thematic, but still mechanically interesting. Flashback Friday - The Downfall of Pompeii - Love it or Hate It? Do you Still Play It? The Downfall of Pompeii, designed by Klaus-Jurgen Wrede, the creator of Carcasonne, is a Euro-style game that also appealed to Ameritrashers. With its clever placement and movement mechanics, this family favorite had you racing for the gates of Pompeii, while blocking your opponents with hot lava and throwing them into the volcano. So what do you think? Love it or Hate It? Do you Still Play It? 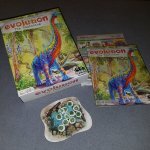 What (Modern) Boardgame Have You Played the Most?